Where have all the spiders gone? 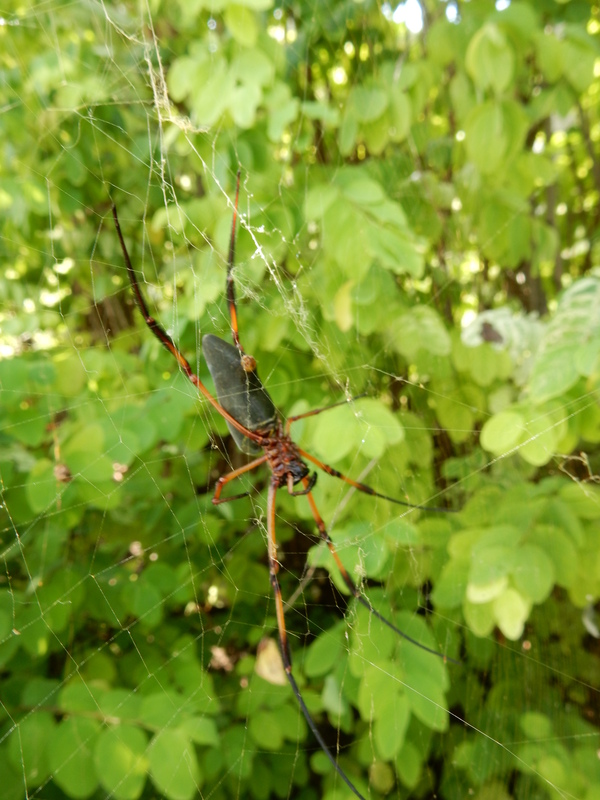 During my two-year residence in Seychelles in the early 1970s I was forever finding myself entangled in the huge sticky webs of Palm Spiders (Nephila inaurata). The female spiders are large, with dark brown bodies up to 3 centimetres long and long spindly legs, banded orange and black, giving the spider a total span of around 12 centimetres. The webs could each reach a span of over three metres in diameter and sometimes extending over seven metres. These enable the females to catch their prey but the much smaller males, and even some other small spider species, also live on the webs and capitalise on the insects and other prey that are caught. Bushes, tall trees and artificial structures were used by the spiders to support their webs. Such was the spiders’ abundance that almost all electricity and telephone wires were festooned with webs and during drives around the islands’ roads and walks along tracks in the bush the ever-present intricately-built webs could not go un-noticed. On rare occasions even small birds, especially Seychelles Sunbirds, became entangled, possibly when they tried to remove trapped insects from the strong and sticky strands of silk. However, these spiders are not harmful to humans. Now, in early May 2016, the most conspicuous aspect of the Palm Spiders is their absence! During drives around most of the main roads of Mahe, on the coast and on the high mountain roads, we have seen no webs in power or telephone cables. There are also none in the gardens that I frequent on my visits to Seychelles, so I no longer get entangled as I walk through the bushes. As far as I am aware, the quantity of flying insects that was caught in the webs has not been studied. However, the ubiquitous presence of webs, and the vast surface area that had been occupied by them up to very recent times, suggests that they might have had a significant effect on the populations of some insects and they doubtless played a role in the ecosystems in which they occurred. Whether the impact of the spiders ever constituted a beneficial role for people, e.g. in controlling pests in gardens or agriculture, is unknown. The long-term effects of the loss of the Palm Spiders is similarly unknown. The reason for the disappearance of the spiders is unclear. The widespread spraying of insecticides, in an attempt to control the outbreak of invasive hairy caterpillars (senir plim, thought to be a species of Euproctis moth – see posts of 14 January and 16 May 2016)) could have affected the Palm Spider directly, or removed its food supplies. On North Island, where extensive fogging with pesticides has not been undertaken (limited direct spraying of infested trees using a pyrethroid, Cyfluthrin, in a hand-held spray bottle has been undertaken), Palm Spiders can still be found. Some Palm Spiders remain on Bird Island, where spraying has also been limited to specific infested trees. However, on both of these islands people have reported a decline in the spiders’ numbers and on Bird in 2016 Christine and I have found only one female in her web, whereas in an island survey in 2001 they were said to be “abundant”. Whatever the cause of the remarkable decline in Palm Spider numbers and distribution, the loss of such a conspicuous part of the islands’ animal life is a cause for concern and warrants investigation. Another new addition to Seychelles’ fauna – another invasive alien species?